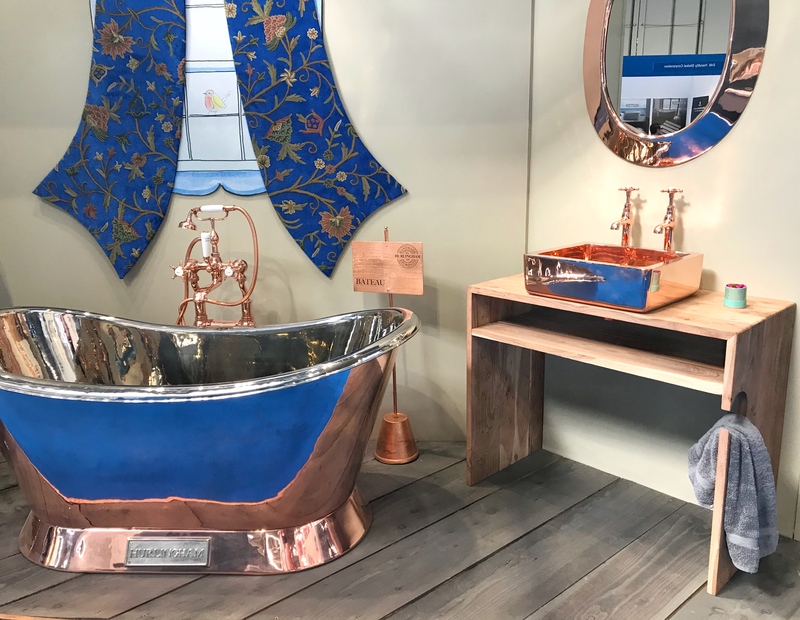 Their selection of copper finish baths, basins and brassware took this trend to a whole new level. 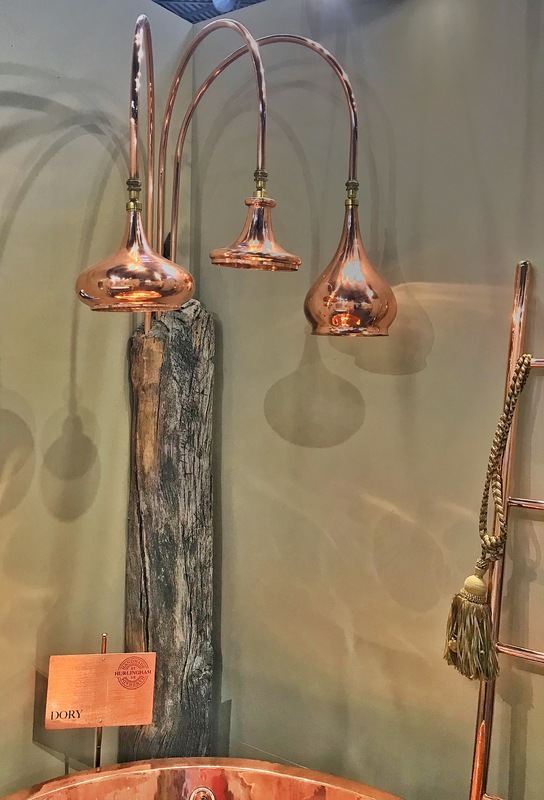 Quality oozes from each and every piece and you can really tell their products are lovingly crafted. 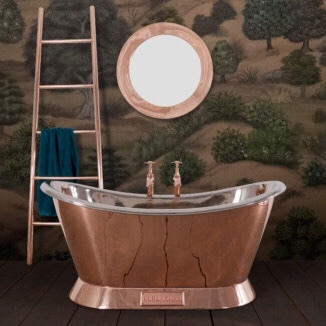 This bath has a nickel interior with a true copper exterior, mixing metallics beautifully. Hurlingham’s own picture on their website really shows off the beauty of this bath. 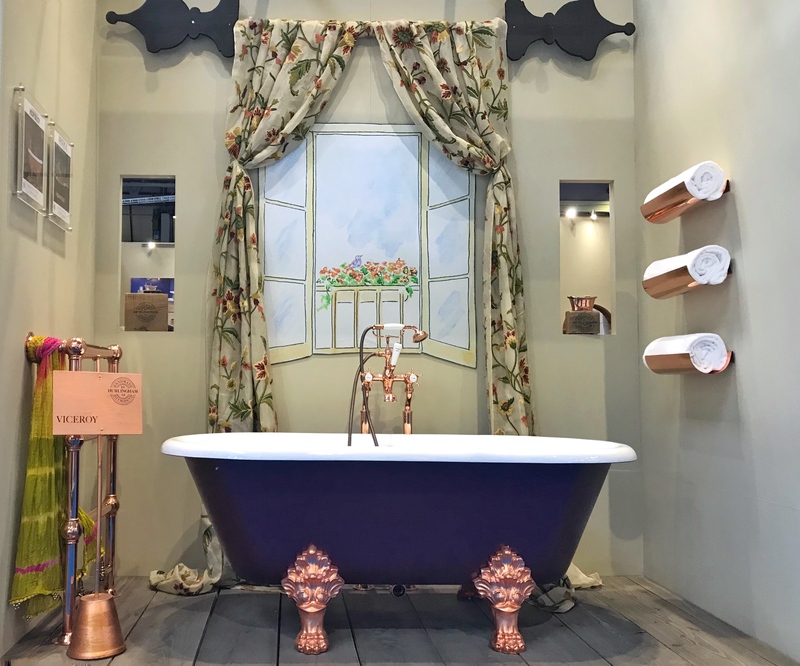 Hurlingham do a range of painted baths, offering the chance to completely tailor your design to suit your personality and decor. They can replicate any hue of colour! 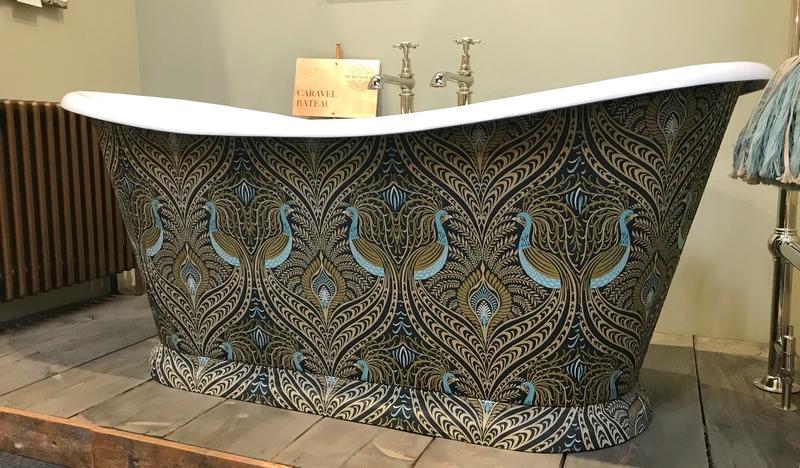 I love the richness and contrast of this deep indigo on the bath they had on display. And those feet… are awesome! Okay, confession time… I don’t know why, but I’m obsessed with taps…. I LOVE a nice tap. For me, an unattractive tap that doesn’t compliment the rest of the room, is not only a huge dissapointment in a lovely bathroom (or kitchen) but it is something that makes such a difference. It detracts from the entire design! 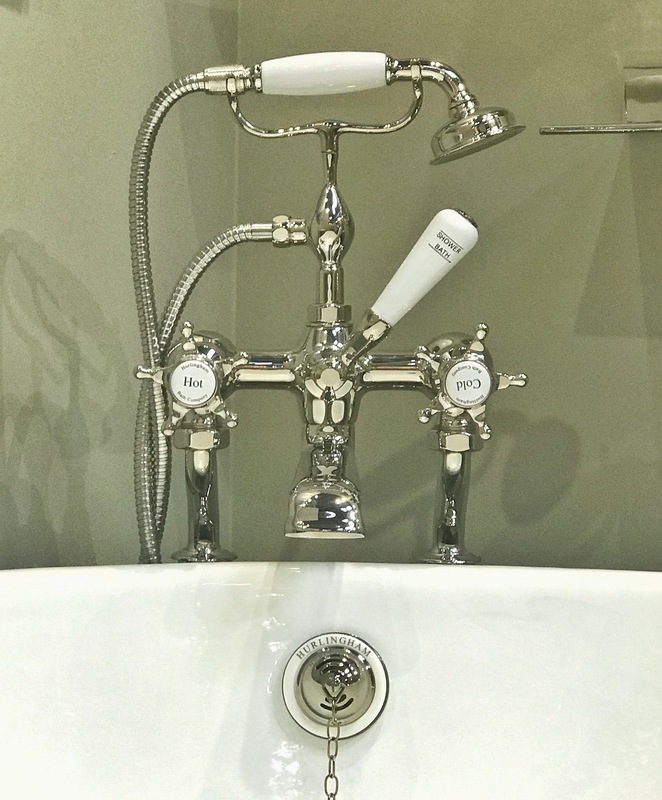 While Hurlingham only do a relatively small range of taps and showers, they are beautiful traditional pieces. And available in a variety of high quality finishes. The overflow detail that matches the tap is such a nice touch. Look at the texture detailing in on this double-ended bath! They do a lot of baths that would really suit a modern style bathroom too – this matt black finish would be an amazing feature in a sleek contemporary bathroom. Psst… they also do radiators and towel warmers to compliment the baths! Bling bling! Stainless steel interior. 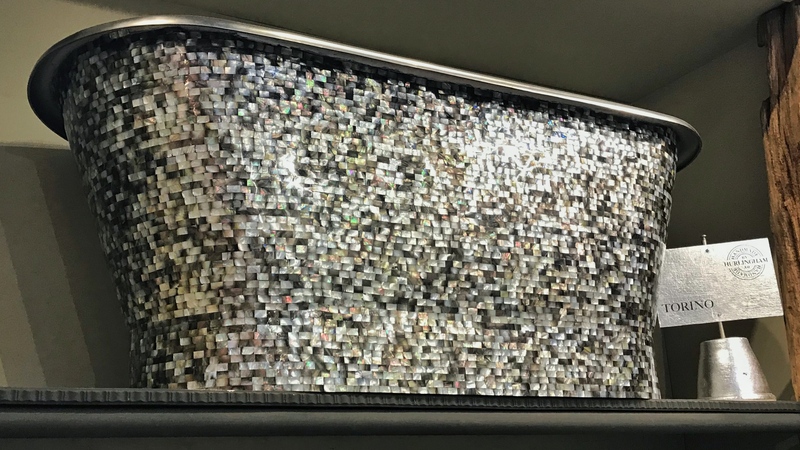 mother-of-pearl mosiac exterior that has been hand-crafted… wow! This… is my favourite, I think. The shape of the bath is so classic and simple, with that beautiful curve of the roll top. I love the decadence and warmth that comes with the fabric finish and this opulent fabric is gorgeous. 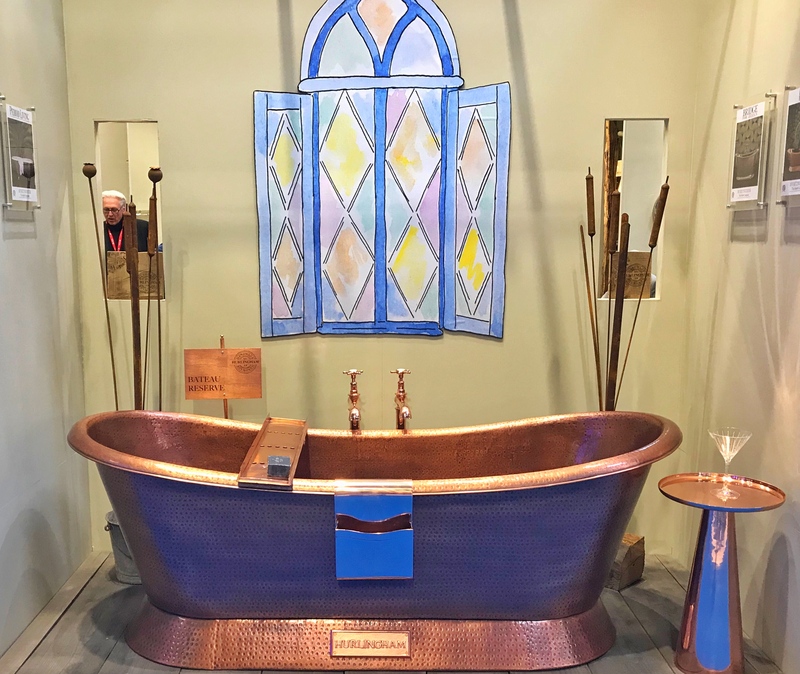 I would LOVE to have a bathroom that could house this beauty some day… A girl will dream! 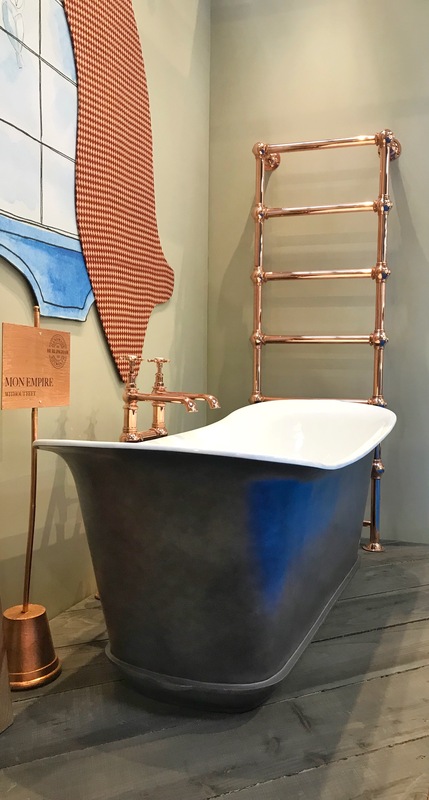 So if you’re looking to have a bath that will showcase your personality and turn heads, then you should definitely check out the Hurlingham website to see yet more beautiful baths and basins.